Graduate of the University of Athens, Greece, Pavlos received his PhD degree in Physics from the University of Southampton, UK in 2003 and conducted his postdoctoral research on optoelectronic properties of organic semiconductors at the Ludwig Maximilians University of Munich, Germany. In 2006, he returned to Southampton as Lecturer at the department of Physics and Astronomy, where he combined his expertise in inorganic and organic semiconductors and set up a new experimental activity on Hybrid Photonics. In 2008, Pavlos was appointed to a personal chair at the University of Southampton. From 2011 to 2014, Pavlos chaired the University’s Nanoscience Research Strategy Group, an interdisciplinary research group of ~100 academics across physics, chemistry, maths, engineering, biology and medicine. Since 2013, Pavlos is the Director for Research at the department of Physics and Astronomy at the University of Southampton. 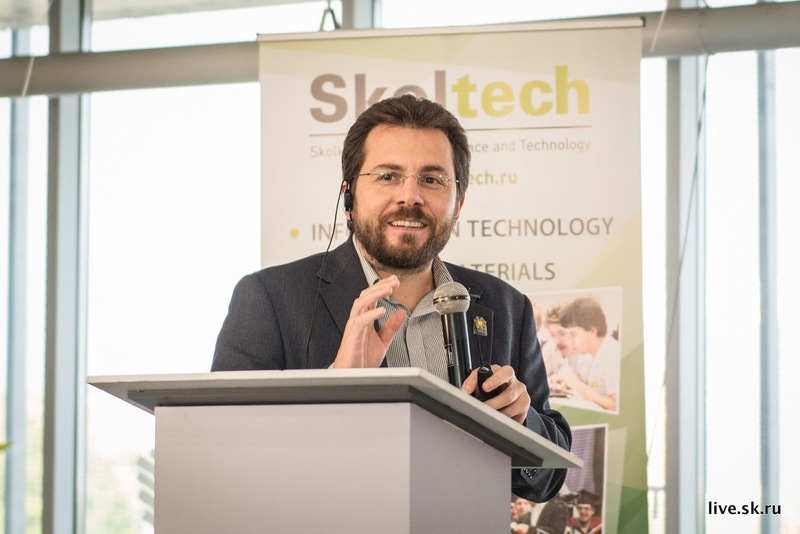 At Skoltech, Pavlos has designed, setup and is leading the Hybrid Photonics Group with a focus on hybrid LEDs, PVs and quantum simulators. Pavlos has pioneered in the field of polaritonics with the first demonstration of polariton lasing at room temperature and he is recognized in the international scientific community for the realization of the theoretical proposals of Dexter (1979) and Agranovich (1998) on hybrid organic-inorganic photonic devices for light harvesting and light emission respectively. For his contribution in the field of polaritonics and hybrid photonics Pavlos received the Quantum Electronics Young Scientist Prize from the International Union of Pure and Applied Physics (Sydney, 2011). Pavlos has leveraged over £20M of funding from the Engineering and Physical Sciences Research Council (EPSRC), the Royal Society, the British Council, UKIRIE, the EU and industry. Pavlos is an author of over 100 peer-reviewed articles, which have appeared in Nature and Physical Review journals, Advanced Materials, and Nano Letters among others. Quantum Electronics Young Scientist Prize from the International Union of Pure and Applied Physics (Sydney, 2011).